Tuesday throwdown is featuring Operation Write Home in honor of our first birthday celebration on their challenge blog! This challenge lasts from today until September 20, 2010. Tuesday Throwdown was created to share our love of paper crafting. Each week we put out a challenge and also give away a prize to participants via a random drawing. There's always something fun to try each week. Come check us out. Our DT shares beautiful samples each week to inspire you. 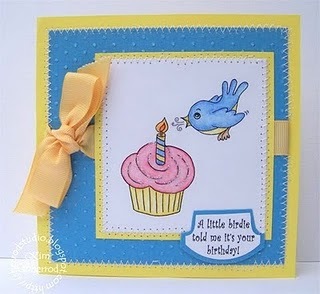 Our sample was made by Kim of the Tuesday Throwdown design team! Here's a link to the Tuesday Throwdown challenge blog so you can play along!